Pedro's Taco Shop has a casual college restaurant/bar atmosphere. It's right on the corner of Tate Street at the University of North Carolina at Greensboro, has a large bar to sit at, plenty of tables, and a covered patio that overlooks Tate Street, perfect for people watching. 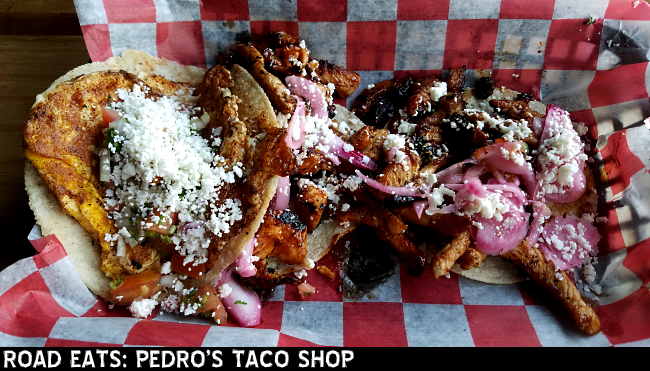 Pedro's offers ten different tacos, eight different burritos, seven different tortas, and a host of other choices. What we had: The Machaca, Hawaiian, Carolina BBQ, Veggie, and Grilled Chicken tacos with an appetizer of Elote Dip (grilled corn, cheese dip, queso fresco, and cilantro). Cost: Tacos are $2.50, but they're a good size. Two with free chips and their excellent salsa can fill you up. Burritos are $8.99 and come with sweet potato fries. What we thought: These were truly some of the best tacos we've ever had. Plus, given the unique offerings, you should be able to find something for every taste.